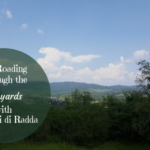 ’Twas the…end of April, and together with my friend Paola Dentifrigi, we were out touring a couple of wineries in Tuscany. We had an appointment with Fattoria di Fibbiano in the afternoon like between 3 and 6 pm. We were slightly late for the appointment but thought that was not a problem. Then Giuseppe Cantoni from the winery called me, asking me where we were as he had expected us at 3pm. We were a bit tainted by the wine already tasted at another winery and I admit I told Paola I felt slightly afraid of him on the phone, as he sounded rather severe. However, when we arrived he turned out to be such a sweet man, and we had lots of fun with him all afternoon. Read on to learn more about Fattoria di Fibbiano which is situated in a part of Tuscany, in Terricciola, close to Pisa and Volterra, which is not that well-known to a general public for its wine production. Talking first more specifically about Terricciola, it is a small town of Etruscan origin. It is called the cittá del vino (the city of wine), as wine is produced here since more than 3000 years and thus a part of the local identity and culture. 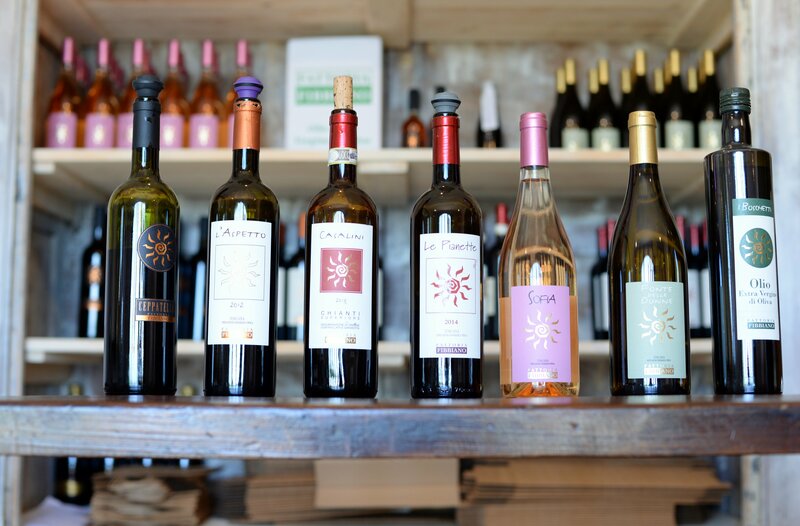 Fattoria di Fibbiano’s philosophy is to continue on this thread of culture and tradition, cultivating indigenous grape varieties instead of more international grapes. In the 1960-70s in Tuscany, the trend for many wineries was to start producing Supertuscans with more international grapes, while the Cantoni family in 1997 decided to do something different and instead focusing on the native grapes and produce wines with a more traditional touch. 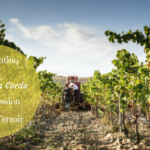 Thus in the end of the 1990s, they started to select a set of native grape varieties, replant them and in that way restore their vineyards to what they once had been. 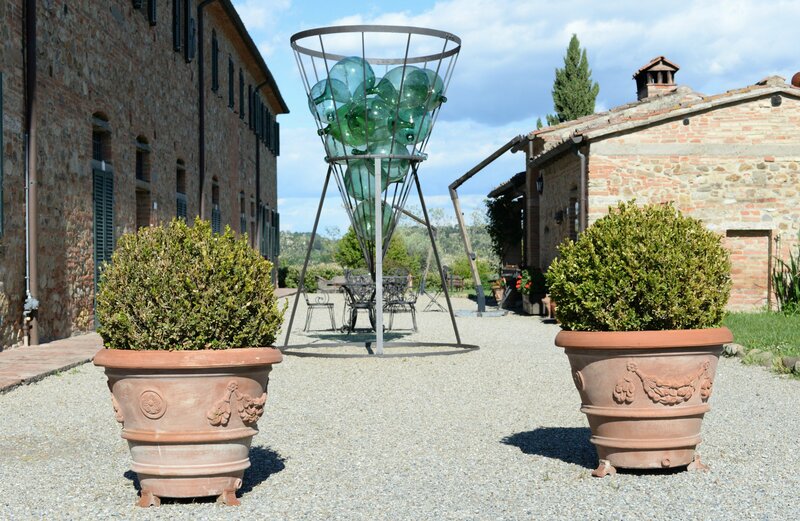 Fattoria di Fibbiano is a winery in Tuscany embracing history and tradition. The estate in itself dates back to the Middle Ages when it was owned by the noble family Gherardi del Testa Barasaglia. It was only further on in the 18th century that the estate was extended to the structure and size it has today. Then, in the 20th century, more precisely in 1997, the Cantoni family from Milan decided to change their lives and careers, especially Giuseppe himself. He was an industrial executive by that time and decided he wanted to return to his family roots as a farmer when he retired. They found Fattoria di Fibbiano in Terricciola while touring Tuscany, and thus decided that it was the right place for them to be. 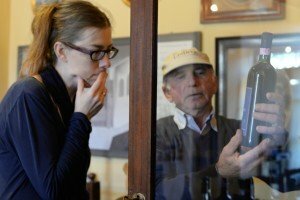 They have since then renovated it all and turned it into a successful winery and an agritourism. They are following an organic way of farming since they started out, but they are only officially certified since this last year. Furthermore, they are a 100% renewable farm, thus being self-sustainable regarding energy use. Photo by Fattoria di Fibbiano. Today the sons Matteo and Nicola run the winery together with their father, Giuseppe. 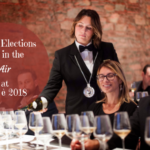 So Giuseppe is the steady and constant presence and support behind the scenes, while Matteo is taking care of the more commercial side by traveling the world to promote their wines and Nicola is the oenologist and thus responsible for the winemaking part. 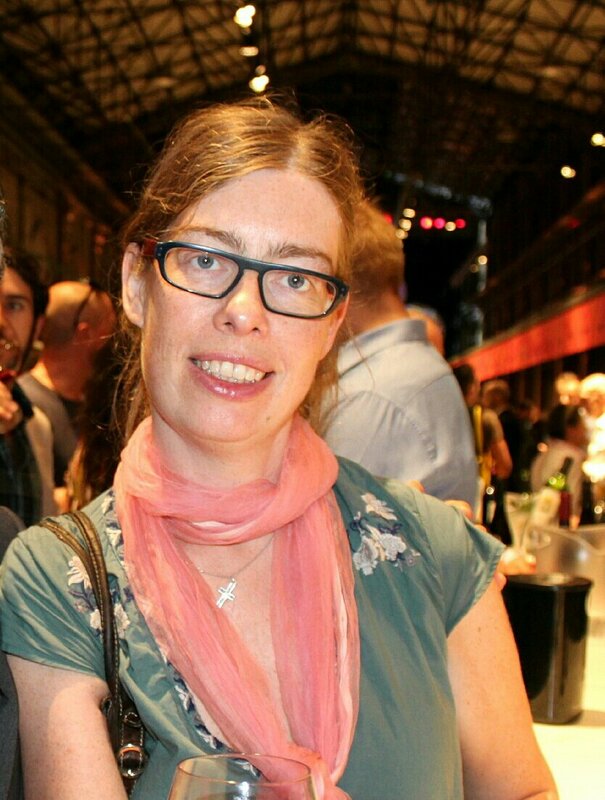 In that way, it is a completely family run winery, as they do not need any external oenologist. The Cantoni family believe in looking upon wine and winemaking as part of their identity and cultural heritage. Even though their agricultural history stems from Lombardy, where Giuseppe’s parents were farmers, they have continued that tradition in Tuscany creating an identity and history all their own. After having shown us the main buildings, among others the old stable that is now the dining room at the agritourism, Giuseppe stopped in front of an art piece they commissioned for the courtyard. He told us they wanted this work of art to symbolize the identity of and work carried out at the estate. The artist having understood that it is a farm where they cultivate grapes and produce wine, thus decided to create the main structure out of old barrel hoops. He then stuck, or slotted, old demijohns inside this steel structure. These demijohns were used in the past by the families living in the area to come to the farm and fill them up with bulk wine. In that way, they had wine for the rest of the year at home. The vision of the artist is, firstly, to show the formation of a bunch of grapes by having stuck the demijohns inside the structure. The second interpretation of the artwork is a flute, like a Champagne glass with the demijohns being the bubbles striving upwards, as you can see below. Giuseppe here started with his quiz where he interrogated me all the time, asking me ”What do you see?”, ”What does this mean?” and so forth. Feeling slightly stressed by being asked questions, my mind turned completely blank and I looked to Paola for help and we just ended up laughing all the time. And in the meantime, I answered: ”Bohh, I have no clue!” So, as you can see, we had a great time with Giuseppe. As it had been raining cats and dogs for a couple of days before, we could not go to have a closer look at the vineyards as the soil was too muddy. That was indeed a pity, but hopefully next time I can manage to go for a walk in their vineyards. 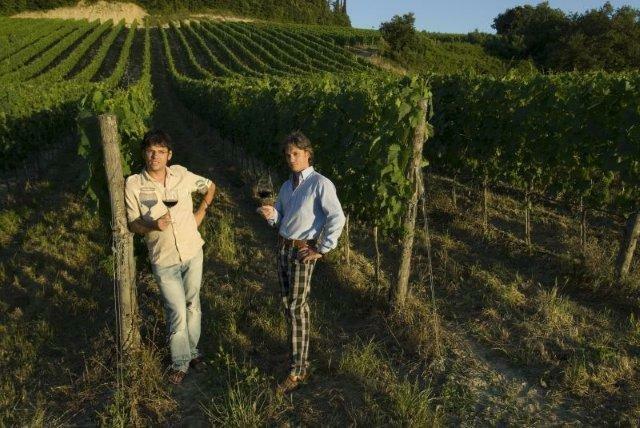 As mentioned above, they are focusing on cultivating indigenous grape varieties for Tuscany, such as Colombana, Vermentino, Sangiovese, Colorino, Canaiolo, and Ciliegiolo. Regarding the soil, just as I mentioned in an earlier article this year, this part of Tuscany used to be the bottom of the sea a couple of million years ago. Therefore, the soil here consists of fossil shells and clay. 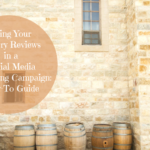 This provides a lot of minerals that leads to complex and well-structured wines. 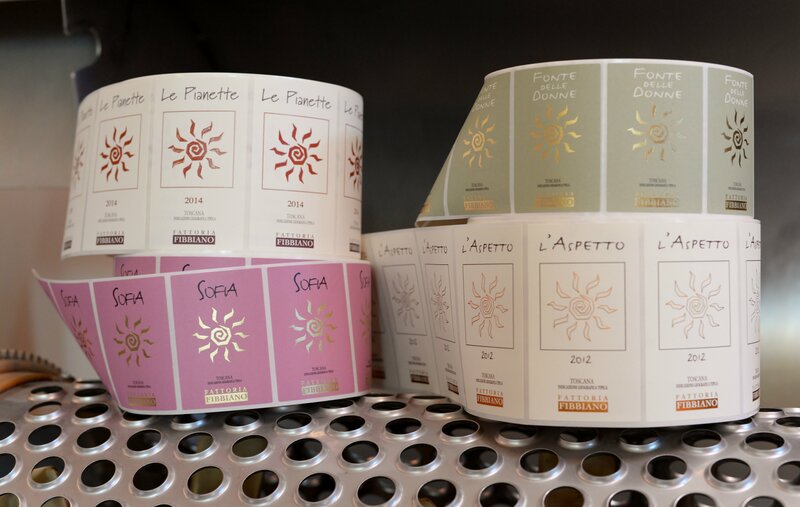 They produce six different wine labels, namely Fonte delle Donne, Sofia (rosé wine), Le Pianette, Casalini, L’Aspetto, and Ceppatella. All the label names are area names that you can find on the map of the property, with exception for Sofia. Fonte delle Donne IGT Toscana – This is a blend of 50% Vermentino and 50% Colombana. The Colombana is a very old grape variety but in the 1960s, it was to a great extent replaced by other types of grapes. It is used for Vin Santo often, but it also seems to be a grape that is often used as a fruit, for food consumption. It is a fresh and mineral wine with notes of citrus fruits. Sofia (rosé wine) IGT Toscana – This is a 100% Sangiovese rosé wine. It is a wine with a pale pink color and with notes of red fruits, such as cherry. It is a rosé wine which pairs well with white meat and fish courses. 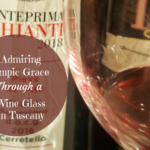 Le Pianette IGT Toscana – This is a 70% Sangiovese and 30% Colorino wine. 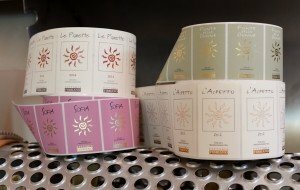 Usually one only add 3-5% of Colorino to give more color to the wine, but at Fattoria di Fibbiano they are using a Colorino Bianco (white Colorino) and therefore they have chosen to add 30% of this grape here. The Colorino Bianco is still a red grape but with a much lower concentration of pigments. The wine is aged for 6 months in barrels of Slavonian oak and 3 months in bottle. Casalini Chianti Superiore DOCG – This is an 80% Sangiovese and 20% Ciliegiolo wine. When Matteo Cantoni was a guest at my #WinesOfItaly Blab, he told me that as Fattoria di Fibbiano lies on the top of a hill, on very dry soil, the Sangiovese, therefore, gets very complex and powerful and provides great structure. They then try to experiment with how to mix it with their other native grape varieties. This wine here is then aged for 8 months in barrels of Slavonian oak and 3 months in bottle. It has the typical notes of cherry as well as of raspberry and mulberry. It is, as said, a well-structured wine with smooth tannins. L’Aspetto IGT Toscana – This is a 50% Sangiovese and 50% Canaiolo wine. It is aged for 12 months in tonneaux, 6 months in cement tanks, and 6 months in bottle. This is an intense ruby red wine with notes of mature red fruit, spices, and a touch of herbs. It is a full-bodied and elegant wine. Ceppatella IGT Toscana – This is a 100% Sangiovese wine, which is made with grapes selected from the oldest vineyard of the estate and the area in Tuscany in general. This is a 120 years old vineyard and thus they are very proud of being able to produce such a wine. For the moment they are marketing the Ceppatella from 2011, so if you buy a bottle of this red wine you are indeed drinking 115 years of history. It is a wine aged for 6 months in tonneaux where the malolactic fermentation also takes place, 14 months in barrels of Slavonian oak, and 5 months in bottle. It has notes of marmalade, spices, tobacco, and cacao and a long persistence. All in all, it is a very structured, smooth, and elegant wine. The visit to Fattoria di Fibbiano was very interesting and entertaining as you have probably understood if you managed to read through the whole article. So far from the family, I have only met Giuseppe Cantoni in person, however, I have met his son Matteo ”virtually” when he was a guest at my wine blab in the end of May. They are indeed lovely people, and I hope to get to know also Nicola and manage to get a tour of the vineyards when I go there next time. 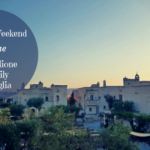 Are you going to Tuscany this year? Then you should definitely pass by Fattoria di Fibbiano. English revision by Susan M. Holman. We spent very nice holidays at Fibbiano, I can highly recommend the apartments – and the wine for sure. And there are so many beautiful places to see in the region… and very good restaurants. Thanks for your comment…Fattoria di Fibbiano is indeed a great place! Ceppatella is excellent, bought some 2 years ago after very pleasant tasting at the winery. Notes of grandfather’s lounge! That’ll be the notes of tobacco and cacao! History somehow makes the wine so much more interesting to try, for me. I appreciate the article, the care taken to portray your visit and yes, I bet it was entertaining. Wow. What a thrill review. I love wine and wine tasting. When… Not if I get there I will definitely check this out as it looks like such a great adventure and place for great wine. Hello Katarina, as you know, I hardly know anything about wine or wineries. But I always love your storytelling and photos. One day I hope to visit Tuscany! This sounds delightful. I have friends who grew up in that region, and I love to visit. Next trip, I may just add this to my list! It sounds like a pretty awesome place to visit. I’d go alone without the kids and just enjoy it. 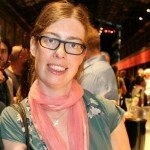 Great article – makes me feel like I am there. Thanks for sharing, and I hope to visit one day! What an amazing heritage and interesting history. Sounds like a beautiful place to visit. As always, your posts put me right there with you. I can’t wait to get to Italy! This article has me ready to book a kid-free trip! Better call the grandparents! 😉 In all seriousness, I do love a good red wine – typically drink Malbec (Argentina) or Chianti. However after reading your post, I have some new labels to look for! Thanks so much for sharing the details! Thanks Holly 🙂 Whenever you are ready…I am here!! You are so knowledgeable about wine! I love it! I also really like how you take us on a journey as you educate us about the different wines. Thank you so much! I purchased a couple of Magnums of Fattoria di Fibbiano Aspetto 2011 Super Tuscan. No one seems to have rated these wines anywhere I can find. Should I go ahead and drink these now, or leave them in my cellar for another year or two? What should I expect from these on my palate? Thanks in advance for your input. Hi John, thank you for your comment and question. Sorry, for replying a bit late. L’Aspetto I believe you can drink now, however, you can probably leave it to age for another couple of years too. I will check about that. The notes will probably be of quite ripe fruit, a bit floral, a bit balsamic and smooth notes, still fresh…structured and smooth at the palate. I have not had a L’aspetto older than 2014 I think…Probably they can age some years yet, but they are surely good to open also now. I would open one Magnum at an occasion, and see how you like it…if it seems to have reached its top, perhaps you open the other ones fairly soon too…or if you think they can age for another couple of years, you can leave some magnums.